Joey Lenkey ’19 wants to be a superhero when he grows up. That’s what he realized while standing in an operating room at a pediatric hospital in Ecuador. Lenkey had walked into that room wanting to be a doctor, but that changed as he watched the team of surgeons led by Dr. Jack Myers ’74. 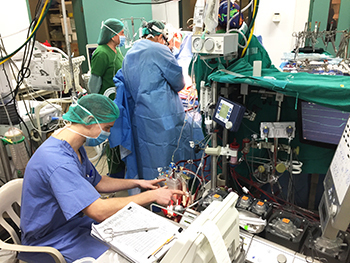 Myers is a pediatric cardiothoracic surgeon who established an award-winning congenital heart surgery program at Hospital de Niños Roberto Gilbert E. in Guayaquil, Ecuador. For nearly 21 years, he has led teams of healthcare professionals on two-week missions to train Ecuadorian surgeons and perform life-saving procedures on children. 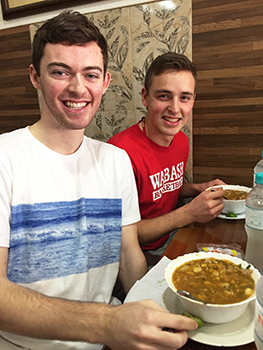 Sponsored by Myers and the Wabash College Global Health Initiative, this time it was Lenkey and Joey Ballard ’20 shadowing him for a week-long immersion. “They had a 12-hour surgery and a 9-hour surgery the first day,” Lenkey said. 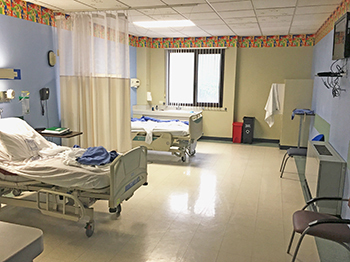 “They didn’t stop for bathroom breaks, snack breaks, or mental breaks – you can’t just leave a child open during surgery. Ballard and Lenkey worked, ate, and slept all week at the children’s hospital. Lenkey and Ballard had known each other for two years before this trip, as both are members of the Phi Gamma Delta fraternity. At the end of each day, it was the two of them in one hospital room together. They shared thoughts about what they were experiencing, bounced ideas off each other, and talked about everything from the surgeries they witnessed to larger societal issues. Ballard and Lenkey were also immersed in the Spanish language. With the exception of one Ecuadorian surgeon, the staff spoke very little English. Fortunately for Myers and Lenkey, Ballard is fluent in Spanish. He translated for Dr. Myers in the ICU, learned about the surgeries from the Ecuadorian team’s standpoint, and talked to them about the country’s culture and politics. Lenkey knows some Spanish. His focus on the trip was learning specifics of the procedures, but some of the doctors were willing to speak slower and give him extra time so he could talk to them in basic Spanish about their kids and what foods they liked. “They appreciated him taking the time, trying to figure it out, and trying to relate to them instead of expecting them to speak English,” Ballard said. Both Ballard and Lenkey are thankful for the opportunity they were given because of Myers and the Wabash Global Health Initiative. Joey Ballard is a Global Health Initiative fellow and will be working this summer as a Dartmouth MD-PhD Undergraduate Summer Fellow. Joey Lenkey is a Global Health Initiative fellow and will be interning with IU Health over the summer. He has also been working on his standing abilities – he’s made it six hours straight and is working toward seven.